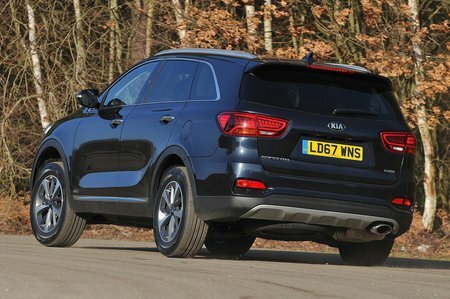 Kia Sorento Boot Space, Size, Seats | What Car? You’d expect a large SUV to be spacious up front, and the Sorento doesn’t disappoint. 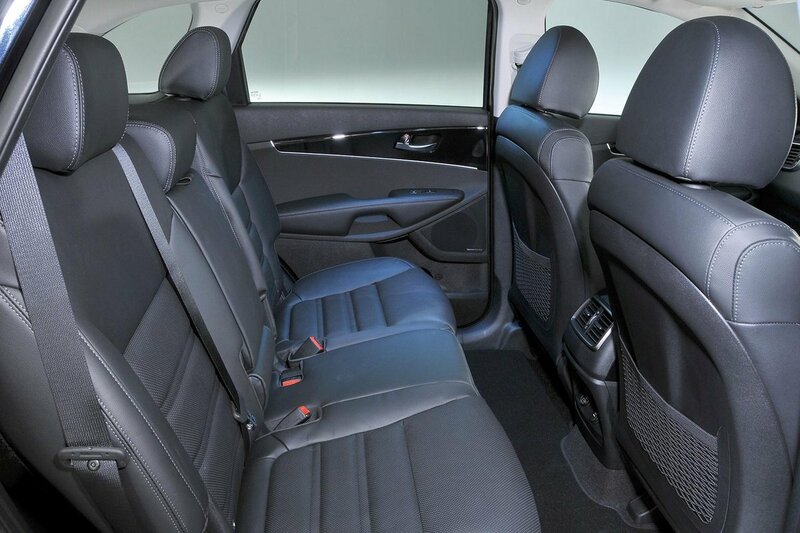 Two tall adults will have plenty of room – there’s lots of head and leg room, and shoulder room is equally generous. Wide-opening doors help make it easy to get into the front seats. Storage space is also good. The door bins are wide and deep, the glovebox is pretty large and the central armrest folds up to reveal another sizeable cubbyhole. There’s also a big cubby in front of the gearlever that’s ideal for storing odds and ends. This cubby gets wireless charging for compatible devices on KX-3 and GT-Line S models. The rear part of the Sorento’s interior is almost as roomy as the front. There’s generous head and leg room for two tall adults to be comfortable and even fitting three is perfectly possible, thanks to the Sorento’s broad interior and flat floor. Head room is reduced by the panoramic sunroof that’s standard on KX-3 and GT-Line S models, but not by as much as in some rivals. Access to middle-row seats is also good and there’s a pretty big storage pocket in each door. The two third-row seats are decent, too. Sure, children will be more comfortable than grown-ups, but the seats are fine if you need to take a couple of average-height adults on a short trip. There’s certainly more space than there is in the third row of a Skoda Kodiaq or Land Rover Discovery Sport, although less than you’ll find in some large MPVs, such as the Ford Galaxy. It’s just a pity that you can access the third row only from the kerbside of the car. The middle row of seats split in a 40/20/40 configuration and the seatbacks can be folded down. These seats slide back and forth to share out leg room when carrying seven people, and they also recline. 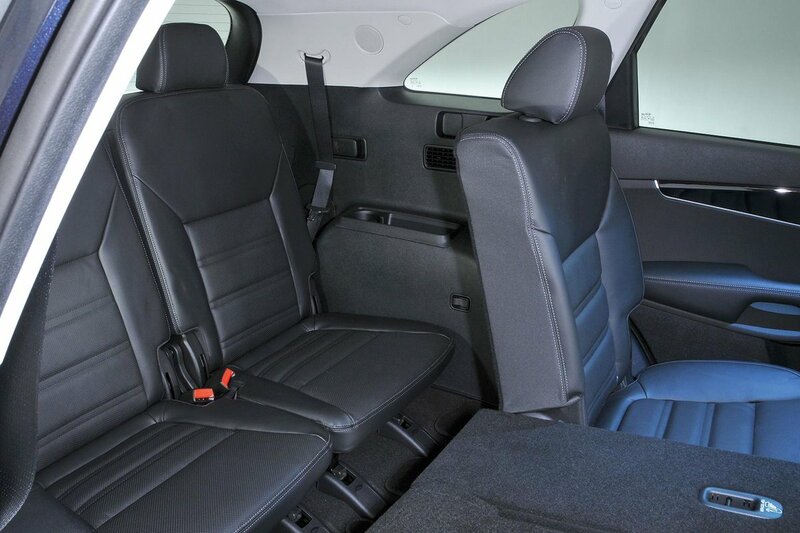 The two third-row seats can be folded individually into the boot floor when not being used. There’s a slight slope from the middle row when both rows are folded down, but it’s not much of an issue. All but KX-1 and KX-2 models have an electrically adjustable front passenger seat. Boot space is another Sorento strong point. There's an impressive 605 litres with the two rearmost seats folded down – that's considerably more space than you get in a Discovery Sport or a Volvo XC60. Even with all seven seats in place, there’s enough room for a few shopping bags or a couple of small suitcases. In two-seater mode, with the second and third rows folded down, the load area is huge. The boot is a pretty practical shape, too, with only a little intrusion from the wheel arches. The floor is flush with the boot opening, so you don’t have to lift heavy items over an annoying lip, and the wide boot opening helps when loading bulky items. The load cover is a roller blind-style piece of fabric that pulls out to cover the boot area. Handily, it can be stowed under the boot floor when it isn’t required.